This year will be my eleventh year in education. After eleven years, you learn a lot, but you also realize how much there is that you just don't know. 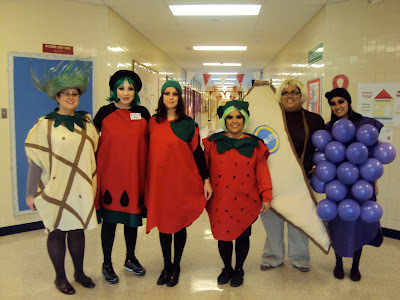 What's the best way to manage a classroom? My ideas on this change frequently. 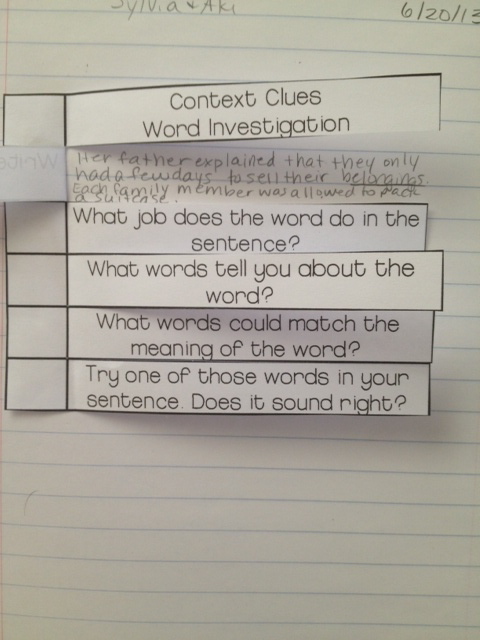 How can I structure my word study time to make it especially valuable? I'm always encountering something new to make this better. At the end of each year, I think about what went well and what didn't go so well. And at the beginning of each year, I think, "This is it! This is going to be the BEST. YEAR. EVER!" And sometimes it is. But sometimes it's a time of change and struggle to grow in. When Misty from ThinkWonderTeach asked me to write a letter to her about my teaching experience, I sat and thought for a while. There are lots of things to write about - every minute is new in the classroom. So I thought and thought, and spent two hours on Pinterest searching for "new teacher advice" and this is what I came up with. Here is my proper letter to Misty. Dear Misty, You are so lucky! You can read this letter and learn from all of my mistakes! You can do it right the first time! All of the dumb things I did that I regret can be avoided by you. I hope so, because we can only have so many nutters wandering the streets after their retirement, babbling about pinterest and book studies. 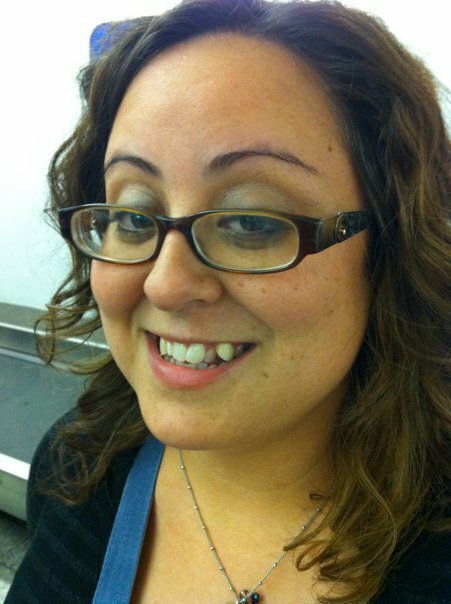 Young(er) me, before teaching ruined me. Haha kidding. mostly. This is my nutter face. It happens when I'm so sleepy I no longer realize people can see me. You are starting to teach in a time where we have a professional online community, full of 'words of wisdom', 'don't do what I did's, and helpful hints. The information of the world is accessible to us in our classrooms and homes. But this can be a double-edged sword. My first important thought is this: Don't Pinterest Yourself to Death. Pinterest is a great place to find a collection of ideas people have shared. Many people. Many different people. Not any one person does ALL of the things that have been collected on pinterest. Most people do a few of them a year; maybe even only one. Trying to do all the 'cute' things we see on pinterest will eventually result in a pineuriusm, or an aneurism caused by pinterest. Choose one or two things that will be helpful and try them. If they don't work out, remind yourself that you have years (many years. Many, many years) before you are able to retire to keep coming back to the classroom and try some more. Pinterest should come with a warning label. 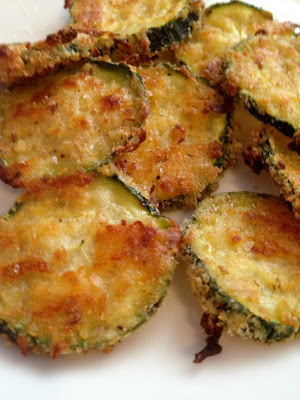 Of course, if you're wanting to throw yourself in pin first, check out my pinboards! I constantly pin things I will probably never do. Follow Me on Pinterest Be a Lover, not a Hater This one was a big one for me (it's probably not that big for you). When I started teaching, I had a plan! I was ready to start and had lots of ideas and knew how I wanted to do things. However, other people had lots of ideas, too. I had a way of listening to the ideas and thinking, "Not doing that. Boring." Sometimes, though, if I had taken the time to think through them a little more, I might have walked away with something great. So my advice is to listen to everyone first, before you decide what you think. And read, read, read about your profession, too. It's hard to know what you think if you haven't heard both sides (or all eight sides sometimes) of a discussion. Don't Reinvent the Wheel I know that was cliche, but I'm trying to take my own advice. Why make up a new phrase when this old one does the job? And that's kind of what I'm getting at. When I started teaching, I spent hours on things that weren't really that important. I'd lay out a document for recording grades, when I could've spent a dollar at Target and bought a gradebook (not that the Target Dollar Spot existed in the olden times). I didn't like the paper guided reading format, so I created an electronic version. Just write on the darn paper. The charts I put up were messy, so I rewrote them. Who cares? Just write neater the first time around. Basically, don't waste your time on stuff that's not that important. Figure Out What's Important Not everything is. The really important thing is your kids. Their learning is important. Not how cute stuff is, not if your binder cover matches your calendar, not if your library check-out system is revolutionary, not if you get to teach about your favorite butterfly. Your kids and their learning is number one. Everything else is teacher stuff, not student stuff. So when you have a decision to make about how to spend your time, spend it on something that will directly impact your kids' learning. That might include lesson planning, preparing questions that will support quality thinking, teaching your kids necessary rituals and routines that will support their day-to-day learning, and mining your colleagues' brains for effective teaching tools to use with struggling readers. 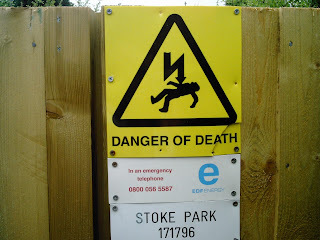 This actually leads me to my next (and, I think, last) point. Sometimes, you're allowed to say no. So when I started, I worked at a campus that was heavily involved in lots of professional organizations and had a lot of practiced teachers who knew what they were doing when it came to reading. This meant that they had been exposed to lots of great opportunities to participate in presenting at, attending events for, and serving those professional organizations. So I did, too. Here's the issue: when I was creating a newsletter for members of the PTO, voting yay or nay at a meeting, or spray-painting my nostrils shut while putting together decorations for a dinner event, I wasn't spending time working on learning that directly impacted my kids. I am NOT saying that you shouldn't be a part of a professional organization that will grow you as an educator! I AM saying that you can't be part of ALL the professional organizations that anyone asks you to join. It will make you crazy. As it did with me. After a few years of this craziness, saying 'yes' to every opportunity, I was nuts. I had to learn to say, "I don't think I'll be able to make that kind of a commitment at this point. I would love to help out, but unfortunately, I don't think it's in the cards this year." After I got better at that, I started to have time for things like eating dinner, vacuuming, getting hair cuts, and going on dates. Those are all important things. So be selective. Choose an important cause that you really care about and feel like you will grow from. That's when you say yes; when it's going to support you. Not because you can't say no. But don't say no ALL the time, because sometimes you make your best buddies when you're both spray-painting your nostrils closed together. Be Part of the Team Make friends. My closest friends that I've made in the last eleven years have been made in the hallway, outside our classroom doors. You're going to spend a lot of time with these people; try to appreciate them and share yourself with them. Your team or colleagues can be the very thing that gets you through the most difficult days, when you receive that snotty note from a parent you've never met because they won't come to conferences, or when you don't know what else to do with your child who's still reading at a first grade level in the fourth grade, or when you forgot to enter all of your middle of year math benchmarks before you go out of town (and your buddy calls you and tells you she did it for you - true story). So cherish them. That doesn't always mean you have to dress up like a pineapple on Halloween so you can try to win the costume contest... but it might. 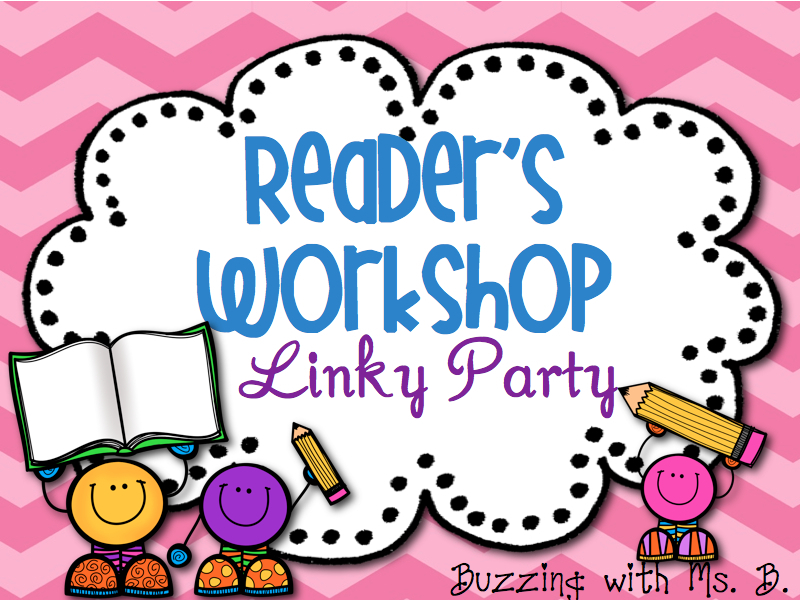 Reader's Workshop MiniSeries: Linky Party! 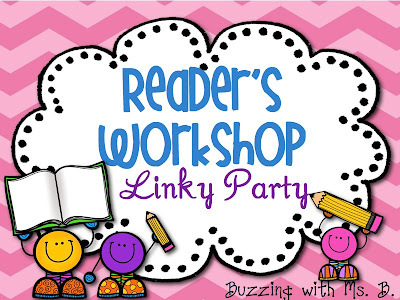 So, for the past couple weeks, I've shared the Ins & Outs of my Reader's Workshop program, tips & tools, and some products, and freebies, too! Many people use tools and ideas similar to those that I use. But not everyone is the same! I know I personally modified some pieces of the workshop to suit my kids' needs and purposes. You have probably created some special systems that work for you and are special to your classroom. What does Reading look like in your classroom? What does your reading program look like, no matter what the program is? 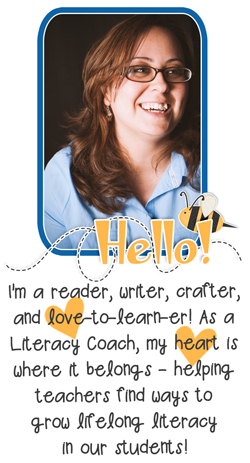 I'd love to have you share how you spend your reading time! 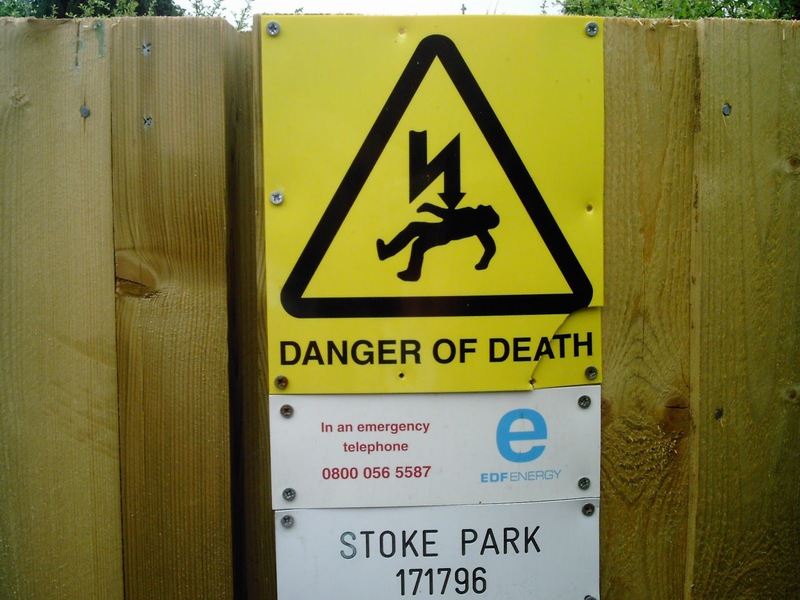 Posts can be linked even if they are older posts that tell us about your reading components. Products may be included in the post, but there should be content with a product in addition to it, not just a product. Link up below and let us know! 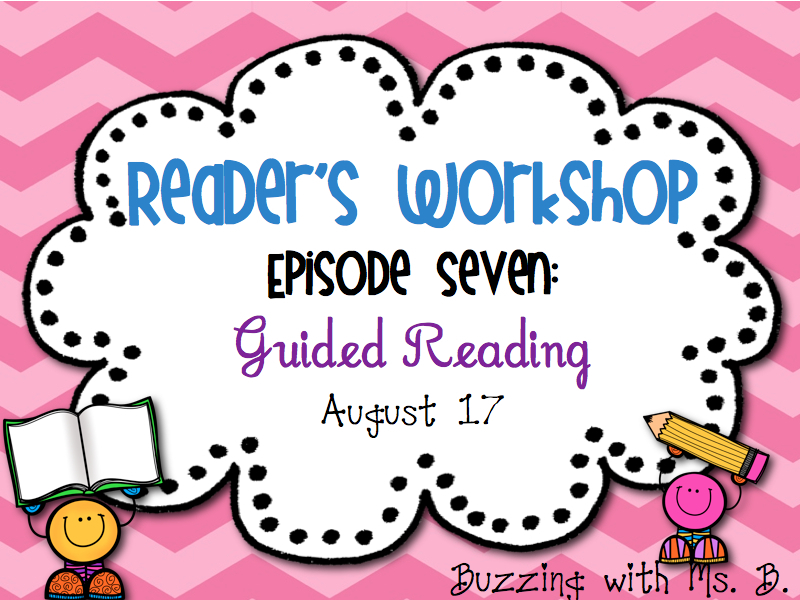 Reader's Workshop MiniSeries: Episode Seven: Guided Reading* Freebie! 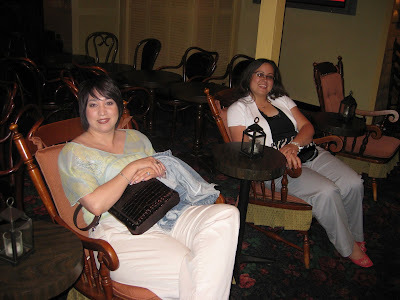 This is the last installment of my Reader's Workshop miniseries. Make sure you click over to my Reader's Workshop giveaway before you go - there are still a few days to enter! Guided Reading is frequently not part of an upper elementary reading program. I know many people do (and I would enjoy doing as well) literature circles or other small group reading activities. 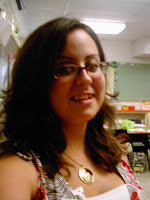 And with my highest group, above grade level, I do often use a literature circle or study format. However, many kids (I feel) need more explicit instruction in how to use the decoding and comprehension skills that have thus far eluded them. Guided Reading is an opportunity for this to happen. Here are some tools & tips that might help you get your space started this year! This is my guided reading area. I know I could do guided reading at the students' desks, in a group, or even on the carpet. But I find that, by having a dedicated space, I am more consistent with guided reading. If I'm making a space as I go, it'll happen when it happens. In addition to this, if it's important to you, make a space for it! That's the first step toward making it happen. It also helps me be prepared: I have a special space and a special time for this crucial piece of reading instruction with all my tools here. It's not pretty, but it serves its purpose! You can get the blends chart from Carl's Corner. 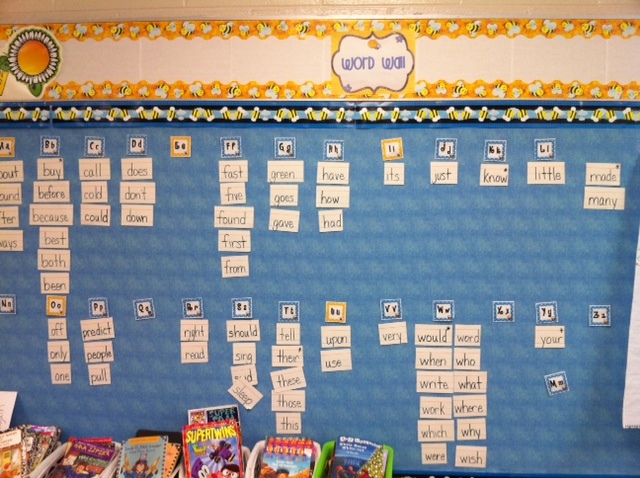 Also kept handy on the wall is the word wall of high-frequency words. On the table, I keep Guided Reading Tools Folders. These are laminated folders with smaller versions of the above tools, accessible to kids in an easy way. Each student uses these to review the word patterns before guided reading by pointing to each one and verbalizing the letters and sounds. Behind my table, I have a bookshelf and a rolling cart full of tools for guided reading. It's the only way I'm prepared for teaching my lessons consistently! On the bookshelf, I keep a storage drawer thing with stickers, white-out, erasers, etc. Each drawer is labeled so I know what's going on inside. 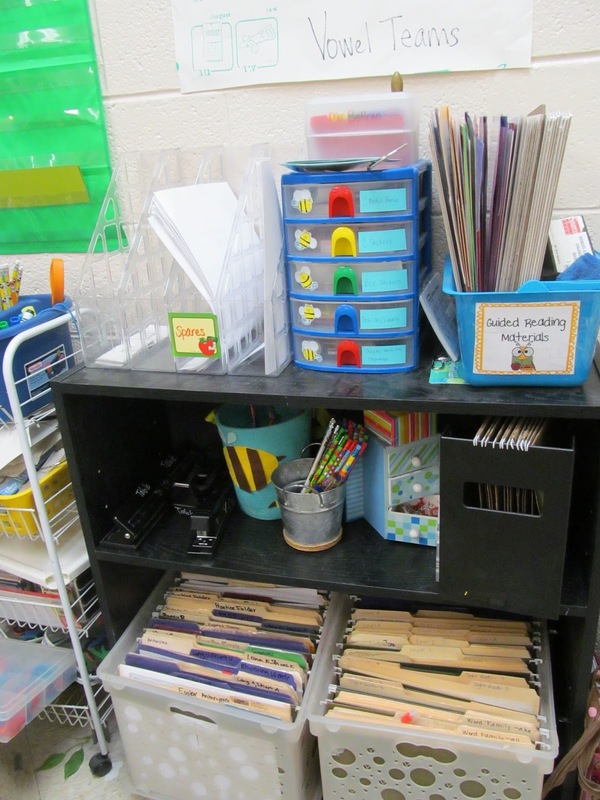 In the basket to the right of the drawers are the student tool folders and dry-erase boards. In the vertical magazine holders, I keep the materials necessary for each group. This includes the upcoming lesson plan, running record form, and the books for the lesson. The middle shelf has a hanging file divider that I use to keep track of documentation. Also on the middle shelf are basic tools like stapler, hole puncher, and tape dispenser. Reward pencils and erasers are there too. The bottom shelf has two baskets. Each basket has materials for word work. In the left are word patterns such as blends and vowel team centers and in the right are sight word building activities. On top of the rolling cart (which has many other shelves full of index cards, sentence strips, and magnetic letters & cookie sheets) is my carry-all for guided reading. It's easy to organize with smaller cups. I keep dry-erase markers, post-its, regular markers, highlighters, and my special guided reading pencils. Special guided reading pencils? YES! I figured this one out a few years ago. I purchase a ton of colorful pencils. These happen to have bees on them (of course). I buy a bunch of the same kind so I can replenish as we wear them down. This is why: I don't want to waste time with kids bringing their own pencil to the table, forgetting it, it's unsharpened, it breaks, it turns out it's not their pencil at all, etc. I got sick of it and realized every minute counts. So, in order to help things roll seamlessly, I kept the guided reading pencils at the table. Kids come to the table, borrow a pencil for the time they spend at the table, and then leave it there when they go back to their seats. The best part is that, since my G.R. pencils are special and all the same, I can tell if one of the naughties stole one! And I can make them put it back. I keep my documents organized in my Guided Reading binder. 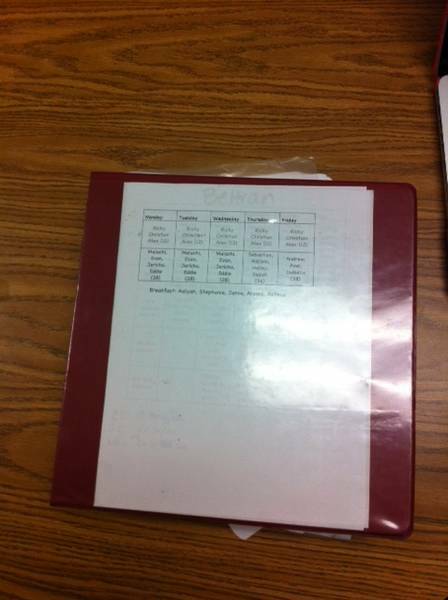 To find out how I organize my binder and plan lessons, visit this post! 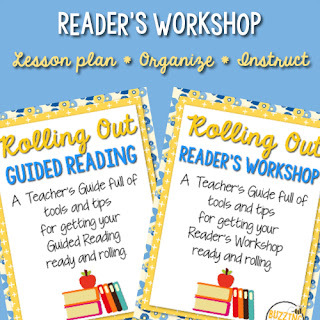 To help you get your Guided Reading ready & rolling, here's a freebie pack full of materials for Guided Reading! Grab it at TPT! 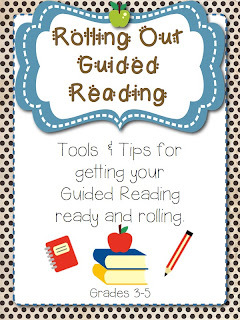 And for my complete Rolling Out Guided Reading Pack, visit my TPT Store! Reader's Workshop MiniSeries: Episode Six: Word Study *Freebie! It's Episode 6 of my Reader's Workshop miniseries! 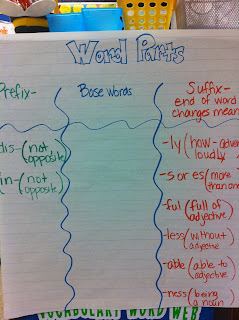 Word study is an essential and often neglected component of our reading program. On Monday, kids glue the poem into their notebooks. We identify the pattern in the words used in the poem (for example, scr blend, /ou/ vowel team, re- prefix). Students mark up the poem to notate the word pattern. 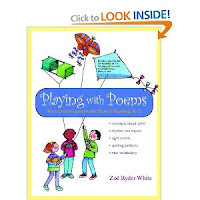 Throughout the week, we work with the words, creating lists using the pattern, manipulate the words, or work with other word patterns we find in the poem. On Friday, we write our own version using the poem as a model. Very fun. 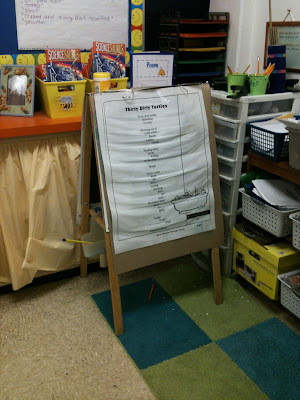 Later, I put the poem on an easel, and students can mark it up with dry erase markers. These are the kinds of things I teach during a third or fourth grade word study. 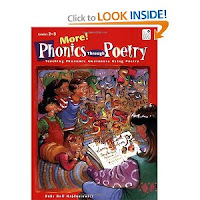 Phonics Skills I know, the big kids should know them. But guess what: they don't! We still have a lot of kids in the upper grades who are missing this basic key to reading. 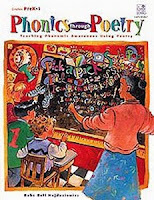 Several years ago, I was blessed to participate in a short training given by our dyslexia teacher and our Literacy Leader. They provided us with some tools that could help our kids be successful. 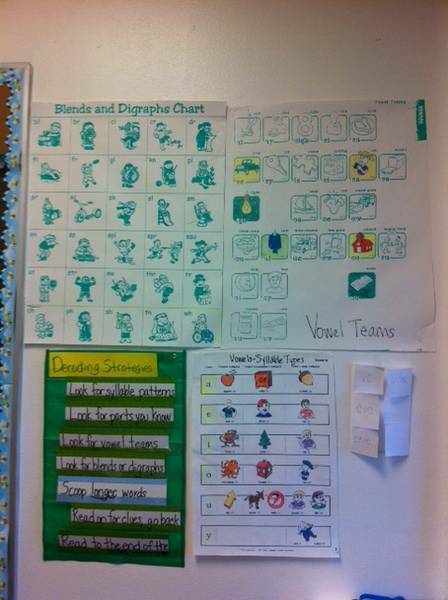 They shared blends, vowel teams, and syllable types with us that are necessary for student success in decoding. By third grade, kids have had several years of these. However, a lot of mine had missed the boat and needed more reinforcement, so I spent some time at the beginning of the year reviewing these necessary pieces of English code. Everything that I had on the wall, the students had a tiny version glued into their notebooks. As we learned a new component of decoding, the kids colored their little version, and I colored the big one on the wall. I stuck them on the wall behind my guided reading table so students could reference them during guided reading. 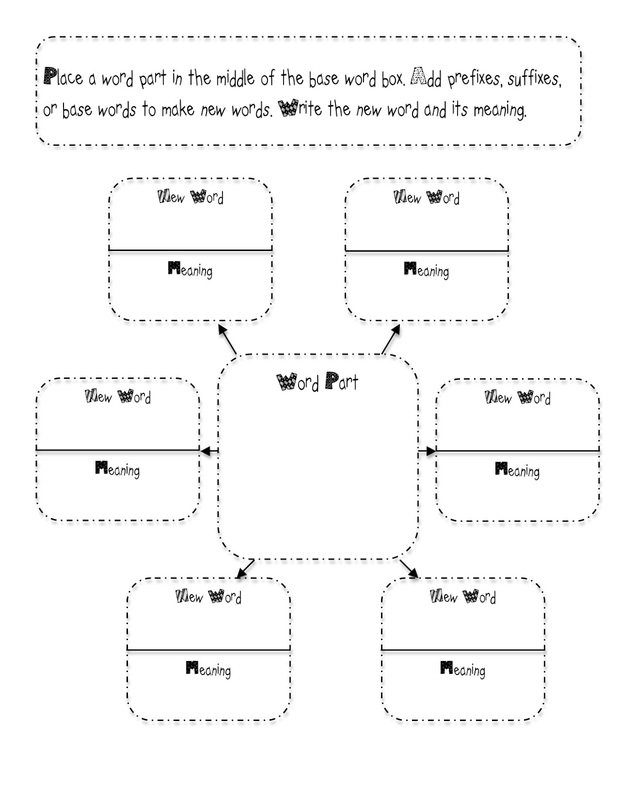 For this kind of word study, I follow a similar structure as I do with phonics. 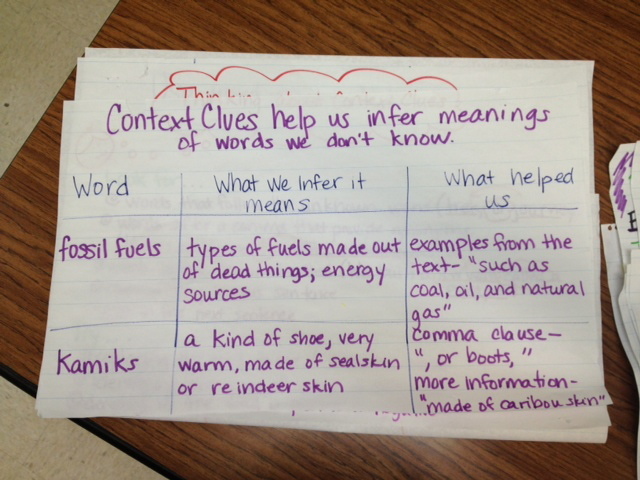 We identify the prefix, determine meanings, and make lists of words. But then we do some dictionary work and identify how the word part changes the meaning of base words. We add the words to our anchor charts and kids can add more to this chart as the year goes on. 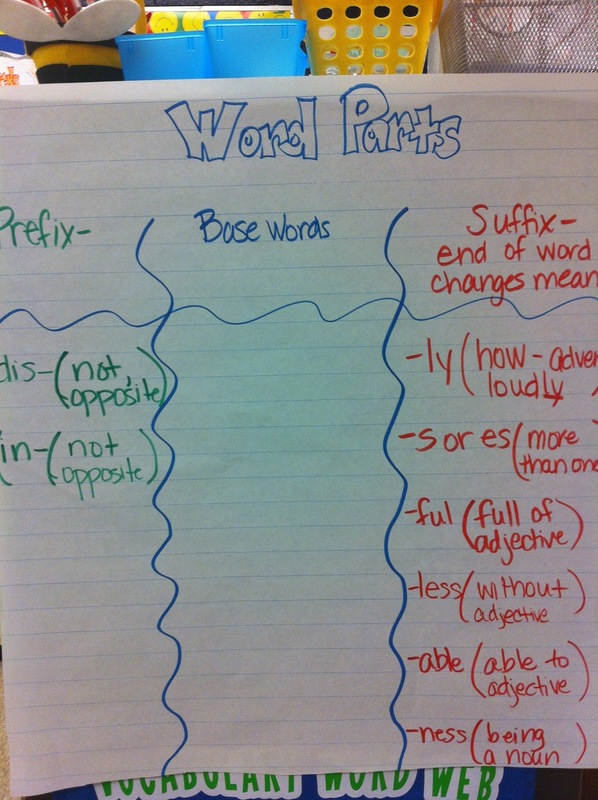 This word map freebie can help your kids explore the uses of word parts. Grab it free at TPT! Understanding the meaning of unknown words is such a difficult task for kids. They don't always know where to look for clues, and even if they've found them, they don't always know what to do with them! So working on determining word meanings is a very important skill. 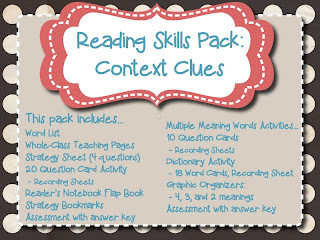 In case you're looking for some tools to help your kids with context clues, check out my Reading Skills Pack: Context Clues at TPT. 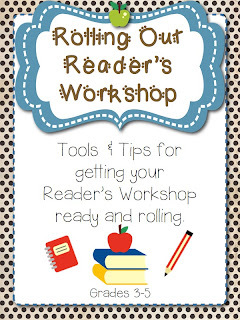 To help you get your Reader's Workshop ready & rolling, here's a seven-page Reader's Workshop Freebie Sampler from my Rolling Out Reader's Workshop! 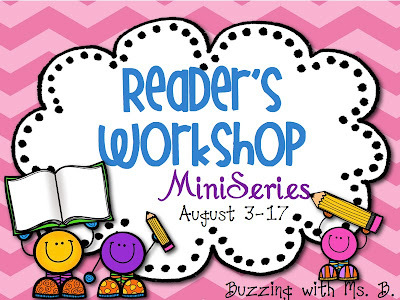 This week I'm wrapping up my Reader's Workshop Miniseries. There are two episodes left: Word Study & Guided Reading. 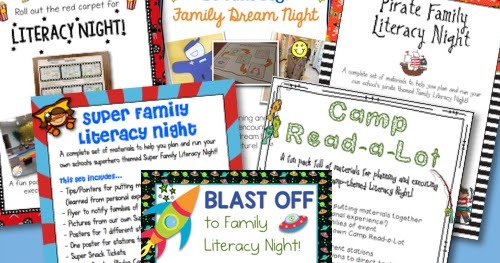 In the meantime, I thought it'd be fun to join a Back to School Goals linky party! Every year, we gear up and get ourselves mentally ready to start a new year with new little people. I've been working with teachers the past two weeks to help set up some plans for the beginning of this year. We've really appreciated the time to put together our structures and routines for reading and writing. Great way to get a jump on the new school year! 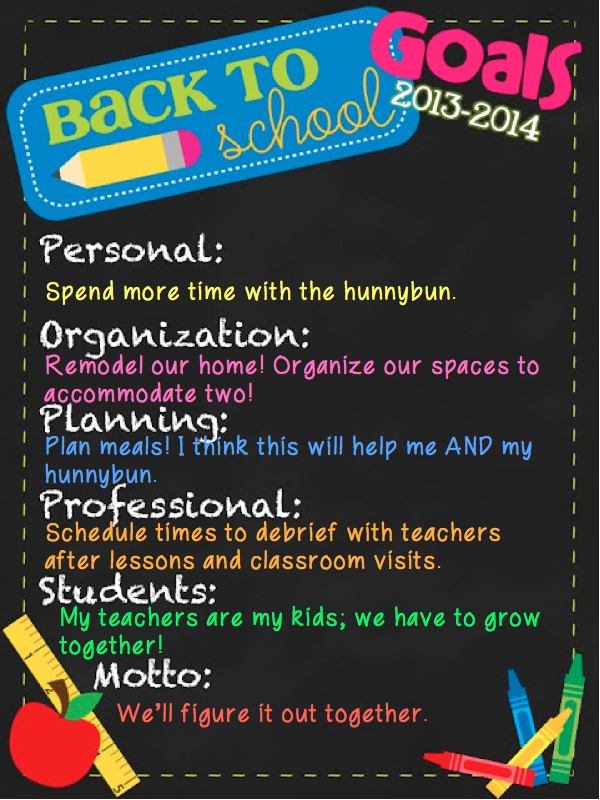 So to help think about my goals for this year, I'm linking up with I (heart) Recess (what a great blog name!) to talk about my Back to School Goals! Personal: This year is a BIG year for me, personally. I'm going to marry my hunnybun in October! We're gearing up for our wedding and looking forward to taking a fun honeymoon. Sometimes I get really caught up in work, and he does too. I'm a stay late-er, meaning I'll go in to work on time at 7:30 but I'll leave at 5:00 or 5:30, and still bring more home to do. We have Saturday Camps and Saturday School at various times throughout the year, and it seriously takes away from my family time. So this year, I want to make a point of leaving at a decent hour. I'll still stay late (I know myself well enough to know that won't change) but I'm going to try to leave a little earlier and hopefully work less from home. Organization: I bought my house years ago and have lived by myself for a long time. When my hunnybun moved in almost a year ago, the house was very much mine. My stuff, my furniture, my style, my old TV from the 80s, and my tiny refrigerator that didn't suit two. We've since made some updates and I had to compromise on a lot of things (like sofas and moving a few rooms around) but the house is still mostly what it was before. We started with the backyard already. After we're married, we'd like to redecorate: repaint, new pillows, change some of the colors. I can't wait! Planning: I don't think this is what "planning" means, but I would like to plan our dinners better. My hunnybun and I both have some weight issues and he has a really bad habit of, if we don't have a plan for dinner, he wants to eat out - and eat badly. He "doesn't like to be limited" his words which annoy me so I have to be careful when planning meals, but I think a good plan would help us. You can read about my attempts to make healthy kale chips here. Let's just say I need some more practice. Professional: I plan with teachers every Tuesday for reading and once a month on Thursday afternoons for writing. We also plan as needed and I frequently schedule meetings, classroom visits, and modeled lessons (myself and other teachers modeling for each other). The hard part is meeting with teachers after visits or lessons to debrief. Teacher time is precious and I want to spend it in the most valuable way possible. 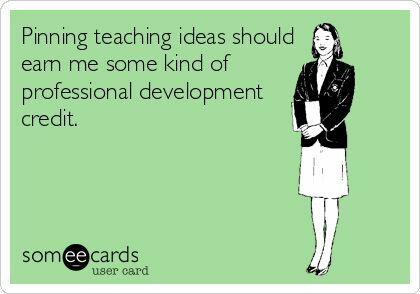 So I need to make sure that I plan purposefully to review and debrief with teachers about the positives in their teaching and new ideas we have. Students: I don't have a classroom of my own anymore (boohoo) but I do have teachers who it is my job to grow. I have to consider my teachers as my students. The tough part about that is that, with students, you pretty much know more than them. With teachers, they all have different levels of experience and teaching knowledge, so it's my job to find new and useful ideas and tools to help them, wherever they are! Motto: I don't always know what the best decision is. In teaching, you try things, and see how they go. You gather your evidence and make plans to improve. You do the same thing in your personal life. The good thing is, professionally and personally, you're not alone. So, no matter how tough things get, we'll figure it out together! This is what our planning looks like. Messy but useful! 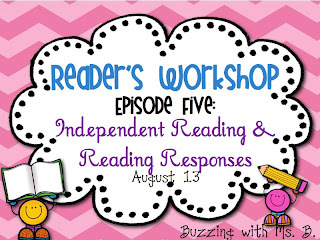 Reader's Workshop MiniSeries: Episode Five: Independent Reading & Reading Responses *Freebie! 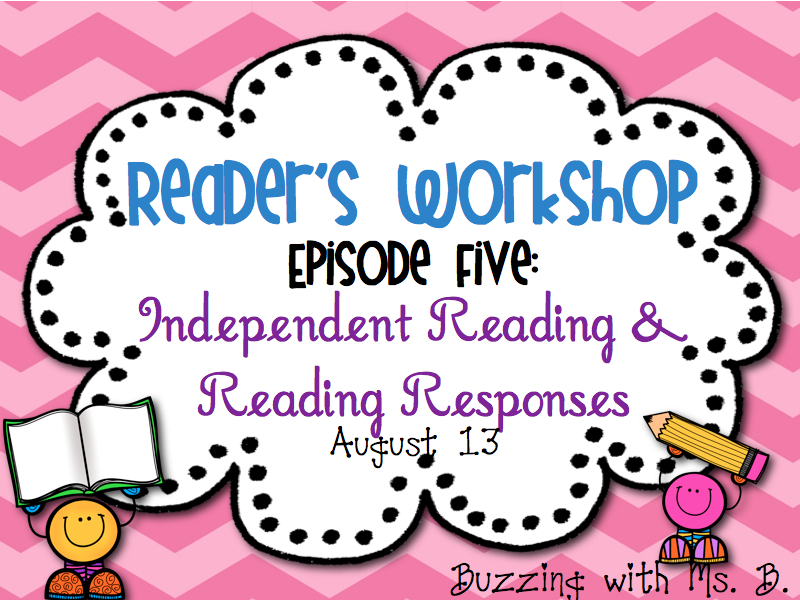 It's Episode 5 of my Reader's Workshop miniseries! One of the most difficult things for me to monitor in my classroom was independent reading. That's why it gets a whole special day during my MiniSeries! Build Up Your Time Let's say that I decided to start running a marathon. Tomorrow, I'm going to lace up my shoes and head out. For the first few minutes, I'll be motivated. I'll be excited that I'm gonna do it this time! After about a mile, I'm going to start thinking things like, "When is this going to be over? How long is a marathon? Should I be coughing up blood? Is that normal?" Needless to say, that will be the first and last "marathon" I'll ever attempt. It works this way with kids. If, on the first day, we throw kids into 45 minutes of independent reading, we're asking for it. They'll try for a few minutes, and then they'll look around the room curiously. Eventually someone will make eye contact, and you will have giggles. The giggling will grow with a series of interesting faces and gestures. Interest in the book will be lost. We have to build kids up a little bit at a time. I start the first day with a goal of six minutes, and I establish a few ground rules. 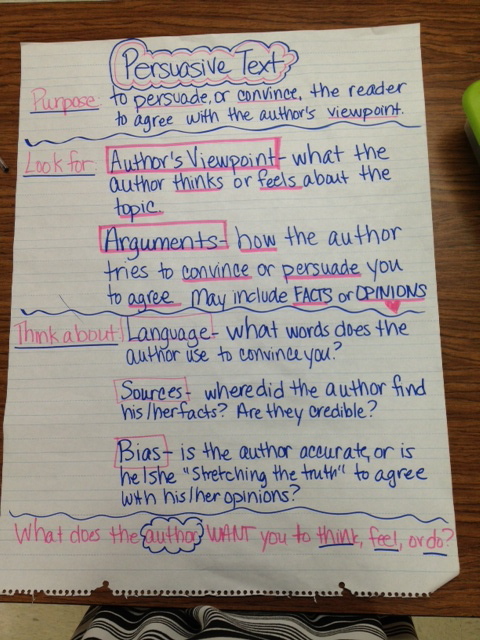 We talk about what independent reading should look like, and we create an anchor chart. I increase the time 2-3 minutes each day, until we are up to 40 minutes of independent reading time. Before students read independently, I set a purpose for them to focus on and to respond to when they're done reading, or during the reading time. 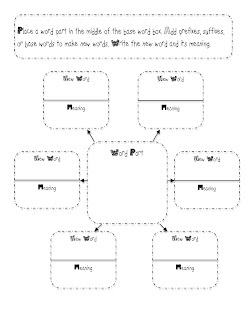 This could be... - a foldable to complete - a question to respond to in their notebooks or on a post-it - a graphic organizer to fill out - a verbal response they will have to share with their neighbor after reading. I post this on the board in the front of the room so each students can see the purpose and recall it during their reading. 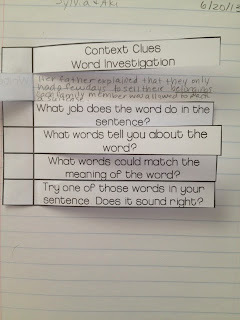 This is a sample item from my Reading Skills Pack: Context Clues! 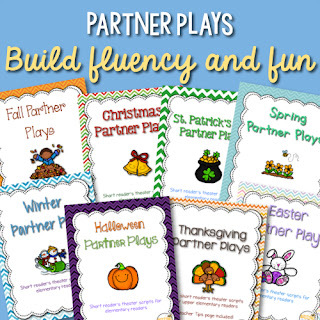 Check it out on TPT. The strategy/skill I want students to practice during independent reading aligns with the strategy we are currently practicing or we have already practiced, so students are able to practice it independently. 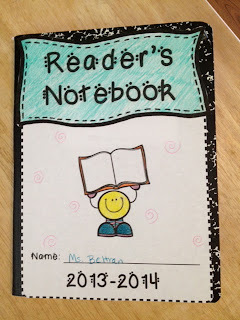 Students record their responses to reading (usually) in their Reader's Notebooks. I have a special section dedicated to reading responses. Students date and title the entry as the title of their book. They record their pages read on their independent reading log and they write their response in their notebook. During independent reading, you are busy! There was a lovely school of thought that, during independent reading, the teacher would read too, and set the model for reading. This would have been great, but realistically, kids need more support than that. We have to take the time to interact with them in a small group or individual setting to help them grow in their reading comprehension and book choices. For the first couple weeks, I usually do conferences to help kids choose books carefully. I also complete the DRA assessment on each student to identify a beginning of year level and some areas of concern to focus on. During reading conferences, I start my anecdotal notes about each student on index cards. Each student has a card and I record some preliminary notes. After a couple of weeks, when I'm done with the DRA, I create a few schedules. 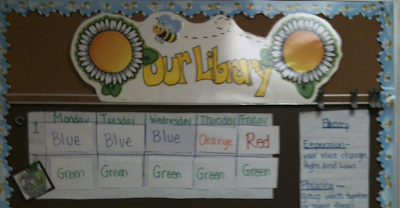 I put together my Guided Reading schedule, a library schedule, and a carpet schedule. Kids love to sit on the carpet to read, but I find it wastes less reading time if they know which day is theirs. I also find kids are more responsible with their library books if they have their regular day to go to the library. (Ideally, I schedule library visits at another time during the day, such as breakfast if the library is open. I'd rather kids spend their time reading & practicing their comprehension skills during independent reading time, if possible). Consistency helps kids be organized (and me, too.) Check back on August 17 for more details on Guided Reading! Reader's Workshop MiniSeries: Episode 4: Shared Reading *Freebie! It's Episode 4 of my Reader's Workshop miniseries! Today is an important piece of Reader's Workshop: Shared Reading. Shared reading is a valuable tool! During a shared reading experience, each person in the room has access to the text you're reading. 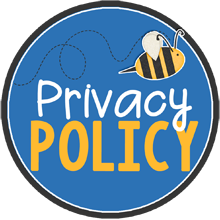 This means that each student can have a copy, such as in a classroom set of books, copies of an article, or a text from the textbook, or the text (if short and font-sized large enough) can be projected or on a chart. This works especially well when it's a poem. Text Introduction Introduce your shared reading text. This is a good time to activate background knowledge and make predictions based on the features of the text. Prompting students about the features of the text genre is valuable too. 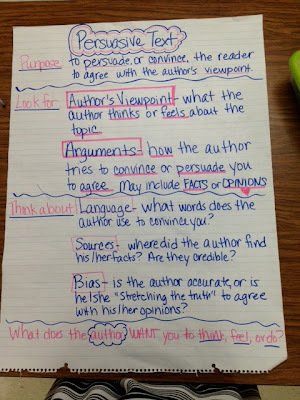 Anchor charts help support student's recollection of these features. 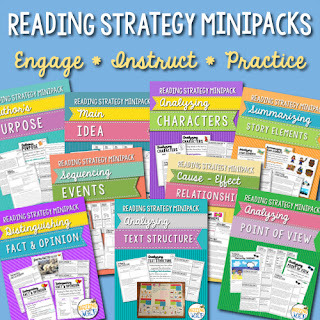 Strategy instruction is the heart of Reader's Workshop. Of course, we have to integrate this with our standards and make sure that those are explicitly taught as well. Focusing on one thing at a time can help. 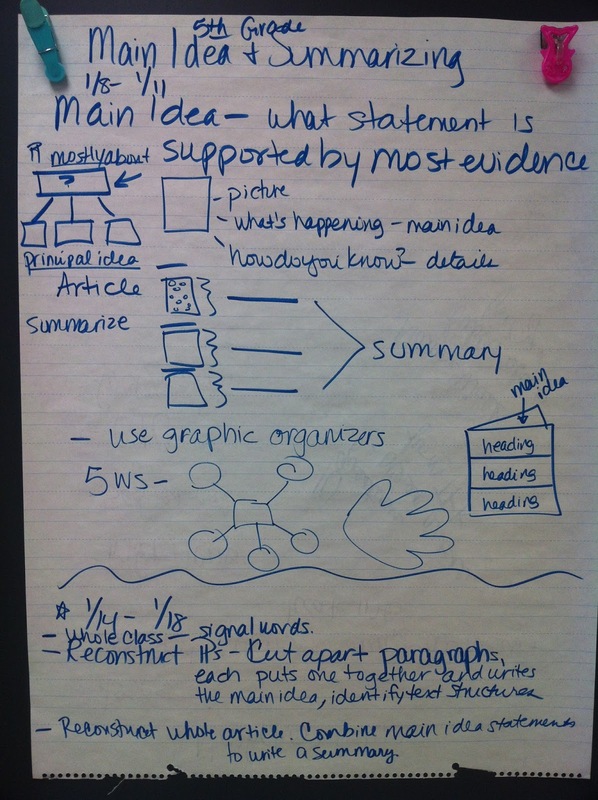 Then you can teach students to use these things together to create an in-depth understanding of the text. Purpose Question I find that a great way to align instruction with standards and to hold students accountable is to establish a purpose question before reading. 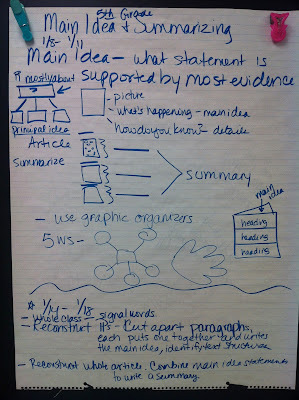 I chart the question and, as we read, we are looking for evidence to respond to the question. I try to align the question with the strategy we are practicing. 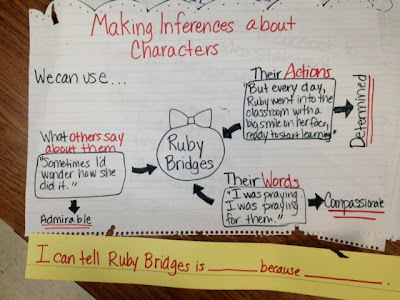 For example, if we were using the chart above about making inferences about Ruby Bridges, my question would be something requiring students to make an inference about her character. For example: - What word best describes Ruby and why? 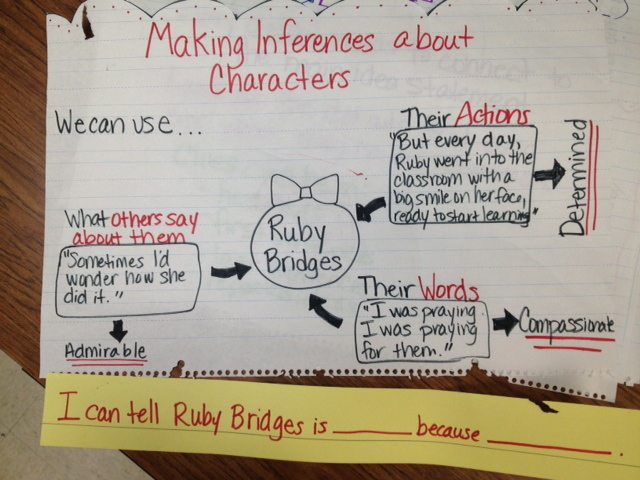 - How did Ruby change from the beginning of the story to the end? - Which characters supported Ruby and how? - How can you describe the relationship between Ruby and her teacher? We want students to respond in different ways: verbally, written, or even dramatically! Carefully choose a response method for your students to address the strategy and the purpose question you created. This could end up in their reader's notebooks as an assignment you evaluate. Follow-Up We want students to practice their strategy in their independent reading text. This means we set a purpose for reading aligned to a strategy we need them to practice. This could take the form of a question, a foldable to create, a handout to fill in about their book, or a notebook response about their reading for that day. To help you get your Reader's Workshop ready & rolling, here's a seven-page Reader's Workshop Freebie Sampler from my Rolling Out Reader's Workshop!